Last night was raiding night with my kin. We were ready to take a deep bite into Acid T2. The group was looking good, that is, we only had one lore-master and one burg, but we had three guards to make up for that. Only... it didn't exactly work out as intended. While we took down the Acid trash on T2 the previous lock and had some good tries on the boss, it just didn't want to work this night. I'm not even sure what was going on. We had experienced people, good DPS... you name it. Do you know that feeling? One night you take down Lightning T2 Challenge and Fire & Ice T2 in one go, the other night you're banging your head against the wall and don't know what's going on. This night fell into the second category. It's not that much to be ashamed of... right? I mean, look at those freaking things, they got three eyes! Player 1 (tank): "Hey guys, I just activated the fight so I'm going to tab out." Player 2 (quasi-shocked): "What?! I mean, nooooo, you can't do that!" The raid watches as Saruman starts a pep talk to his soon-to-be-lost minion and, after what feels like ages, slowly dodders off to his tower. Yes, you should think hey had fixed that. But no, it was actually working as intended. Aargh. Player 1: "<Player 2> , would you mind healing up there?" Player 2 (rune-keeper)'s vitals suddenly show a distinct lack of morale. Player 3: "<Player 2> just jumped off the tower, man!" This is no source of concern, though. Player 3: "Don't worry, I know he bought 1h FAIL immunity from the Store..."
... a free lift from Gwaihir, the giant eagle! Really, I cannot resist that feathery thing of cuteness. Especially when it just saved me from certain death. Nevertheless, we also got a more mundane reward: our kin's first clasp! We figured the whole fight out, killed Saruman (T1) as first of the server... but never got a clasp. Ordering everyone to wear that lucky horseshoe surely did the trick, and our guardian could go home in a very happy mood. Be fast though, I heard it expires on Thursday. 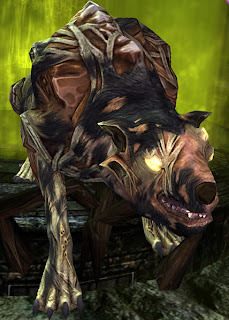 Gwaihir is just the cutest, isn't he? We totally agree! Although I think Landroval and Meneldor are doing well too. The clasp went to Sigi. He used to mainly play champion and minstrel, but swapped to guard when those became a bit rare in our kin.